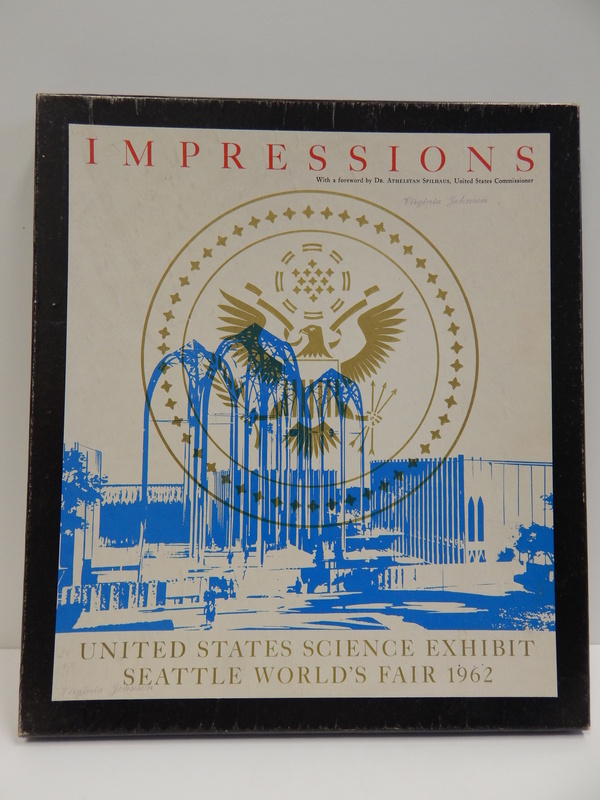 This box of art was sold at the US Science Exhibit at the Seattle World’s Fair 1962. I found this treasure in one of my many estate sale stops. The prints inside of it are not my cup of tea but they are indicative of the time and what was considered a blend of science and art. Check it out and let me know what you think. 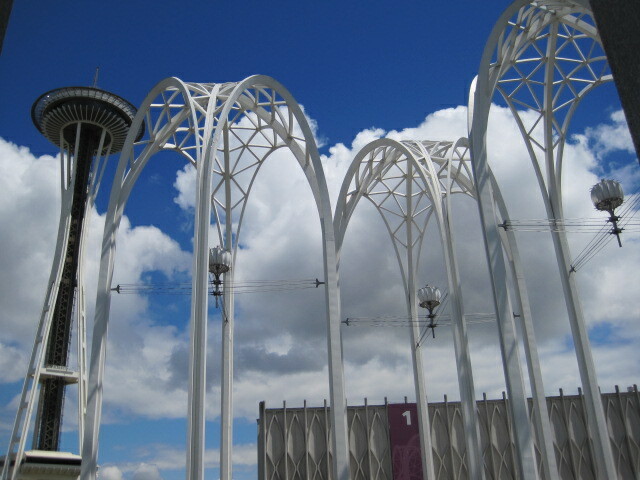 We in Seattle know this beauty as the Pacific Science Center. 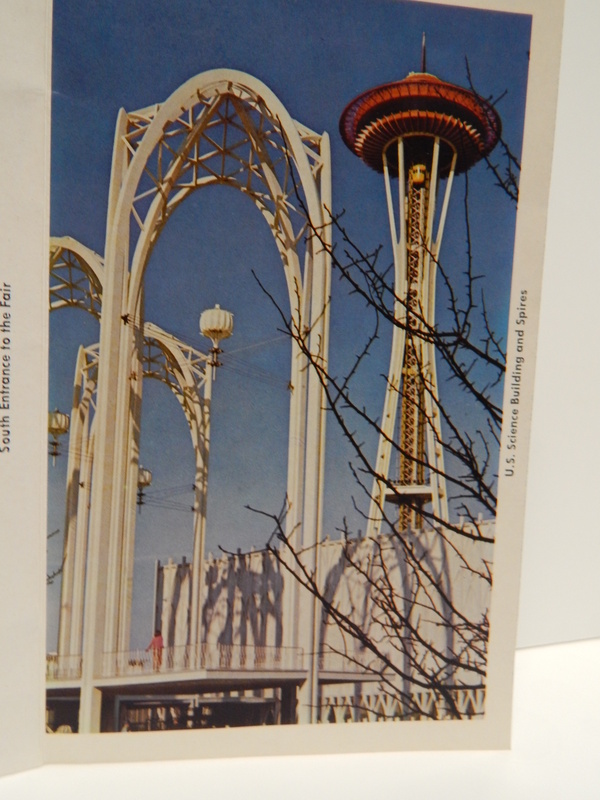 The photo above was taken from an airplane right before the 1962 Worlds Fair in Seattle opened. 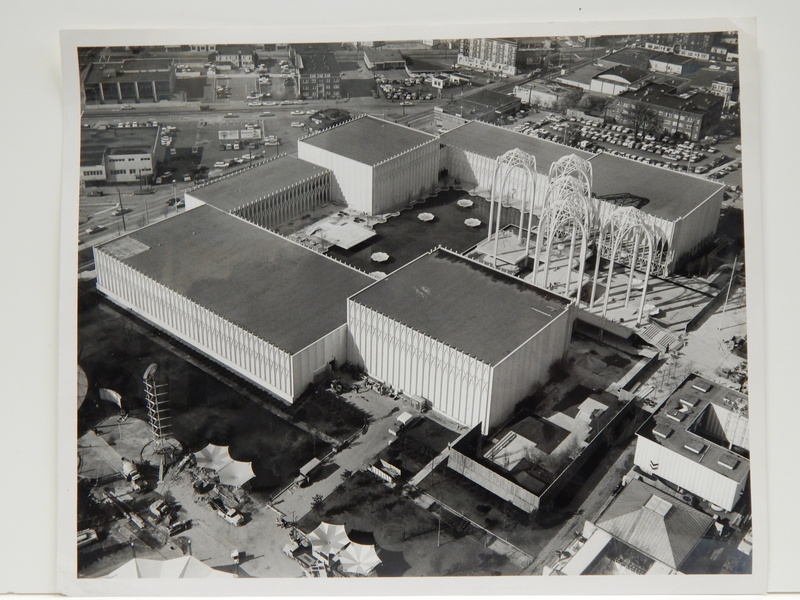 The back of the photo was stamped by Boeing and had information regarding the building. This second picture was taken a few years ago when we visited the center to see the King Tut Exhibition. She has become a jewel of the Seattle Center. The 1962 Worlds Fair has quite a few buildings still standing. 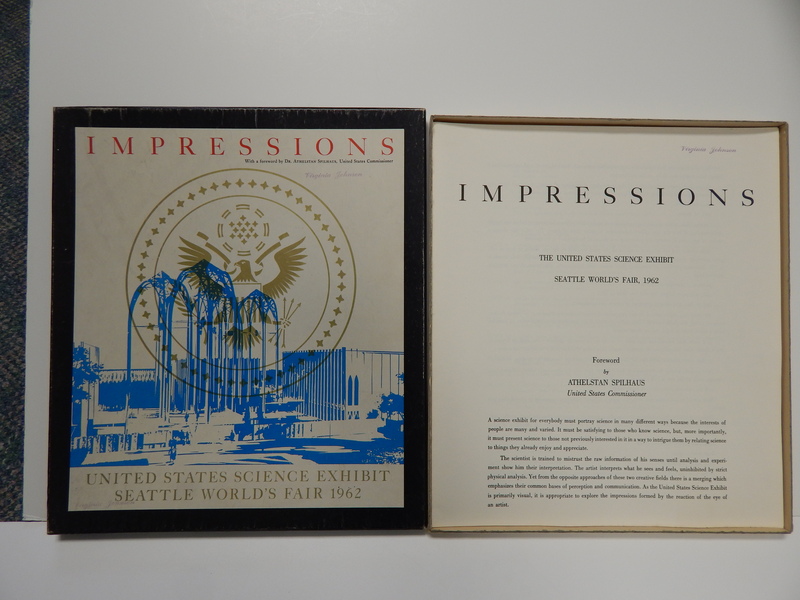 Unlike a lot of other Worlds Fairs, Seattle used the fairgrounds to build a wonderful civic center. The Space Needle, the Washington Pavilion, the Science Center, the Food Arena, the Exhibition Hall, the Northwest Rooms (Fine Art) and the Fountain all still stand. There is also a stadium that was an existing facility on the grounds that is still hosting sports events and concerts. The Food Arena was an old armory and will probably withstand time more than any building. It was built when things were constructed to last. Back to the US Science Exhibit. 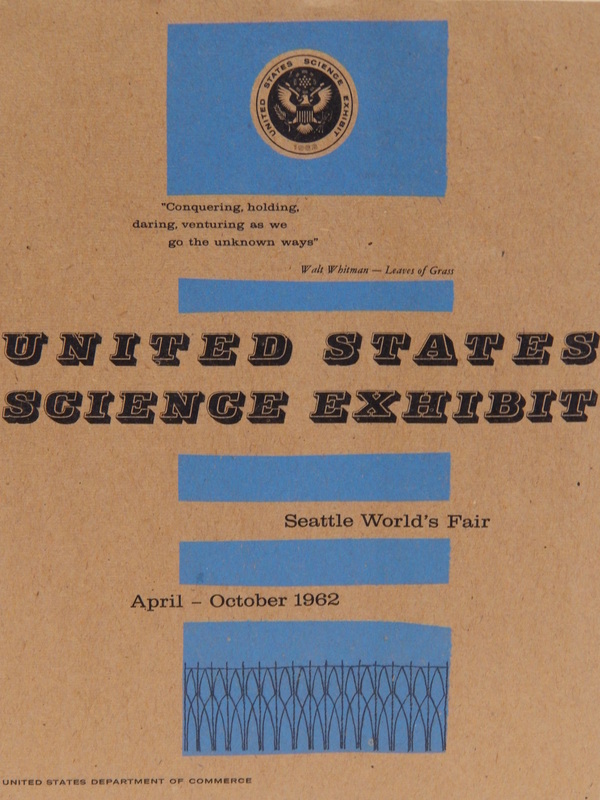 The Seattle Worlds Fair concentrated on the future and science and space was at the forefront of its theme. Next we have the Guide from the exhibit. It is nothing fancy and is printed on brown paper bag type paper. Very unassuming for such a special place and in today’s world would never be that plain wrapper. I also have several guide books or programs. Here is some material in the official program. What Worlds Fair does not have postcards? 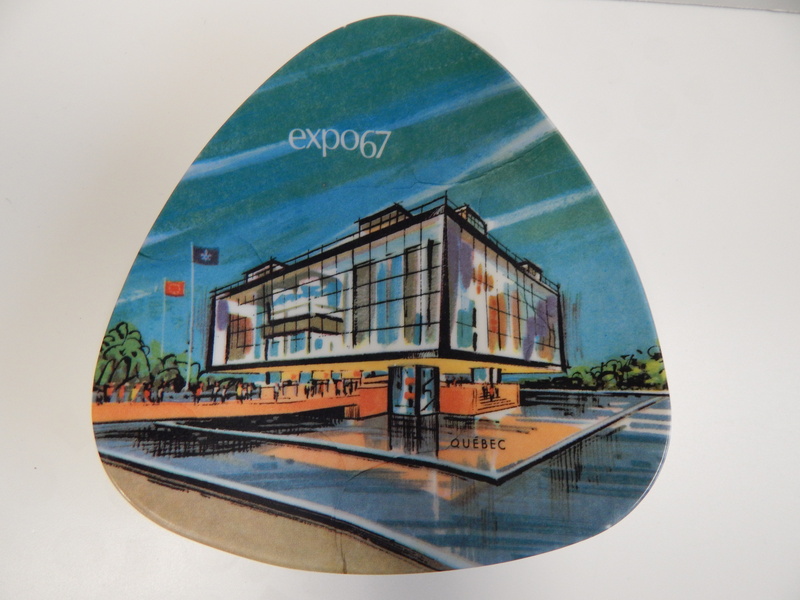 Today’s piece of memorabilia is from the 1967 International and Universal Exposition or better known as Expo 67 that was held in Montreal Canada. This was the most successful Worlds Fair in attendance with the largest one day in history. 569,500 people came on the third day to set the record. I found this little melmac plate here in Seattle. When you look at the picture of the back you can see it was priced several times for sale. My guess is this was bought second-hand versus new at the fair by the folks whose estate sale I visited. We did a little clean up on the plate because it had tape residue on the back and front. Someone had displayed it by taping it down. Here are some more views of it. 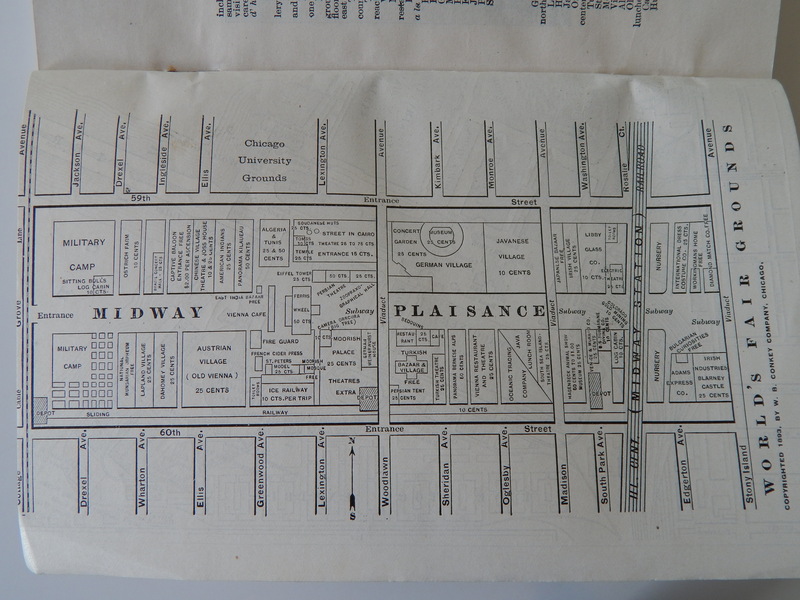 In 1893 Chicago showed the world what it was made of. They pulled off an International World’s Fair. It was BIE (International Exhibitions Bureau) sanctioned and classed a Universal Exposition. It was also a celebration of the 400th anniversary of Columbus’s arrival in the new world in 1492. 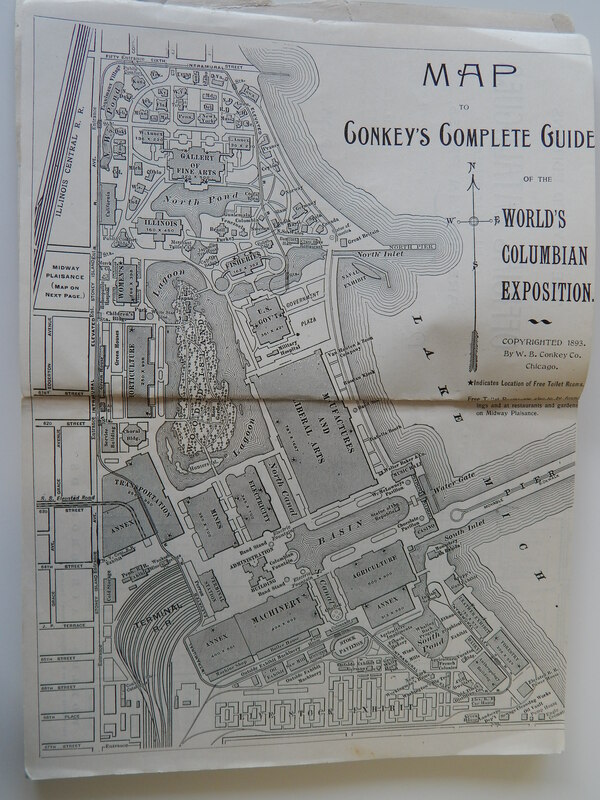 Hence the name World’s Fair: Columbian Exposition. I found these items here in Seattle at an estate sale looking for Seattle World’s Fair memorabilia. I could not resist adding this to my Seattle collection and since then have widened my purchases to many other fairs. 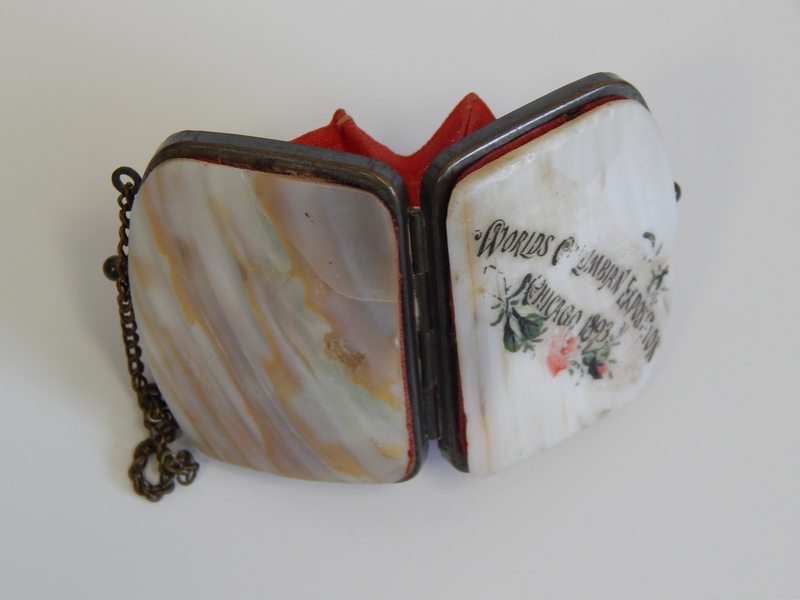 The little coin purse is only 2 by 3 inches in size but it survived fairly intact for over 110 years. 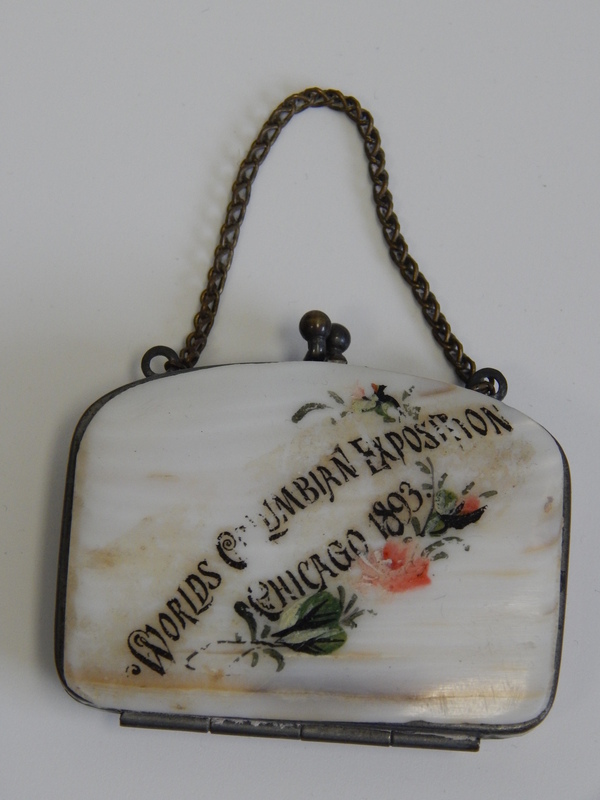 The outside is mother pearl glued onto the brass frame. 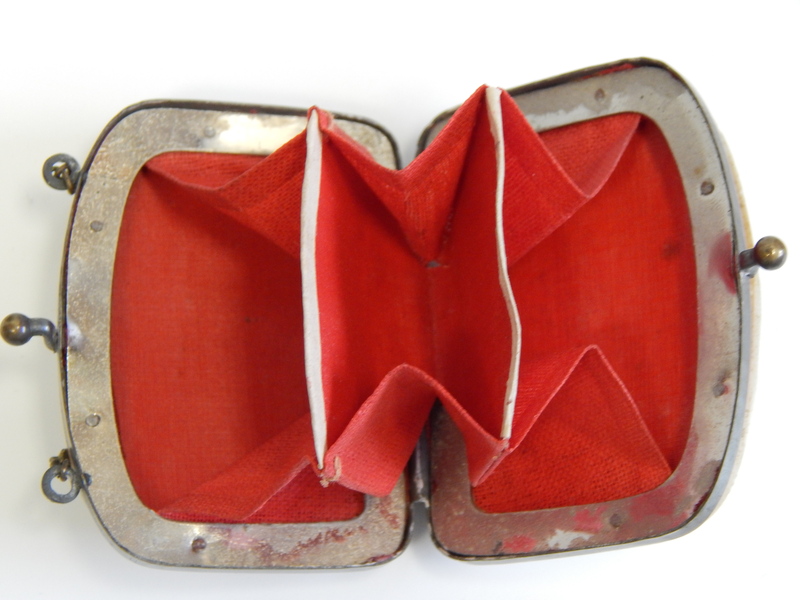 It has a red cloth interior that looks to have never seen a coin. 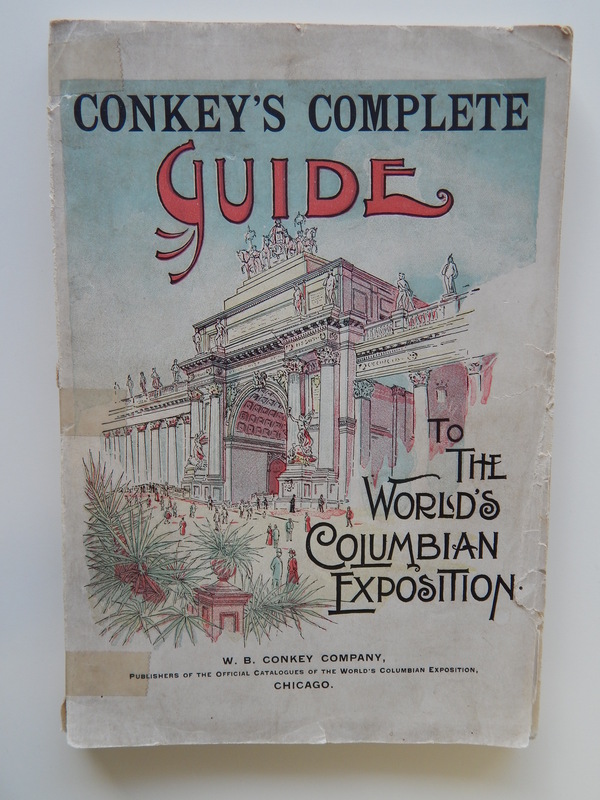 The other item I bought at this estate sale was the Conkey’s Complete Guide to the World’s Columbian Exposition. 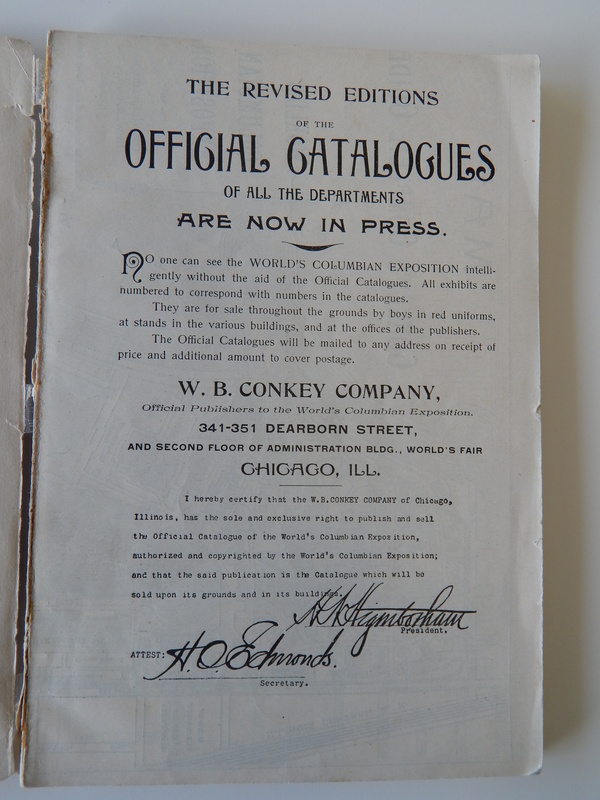 My collection of Worlds Fair items all began so unintended. A work pal brought to the office some items he was selling. His wife and him were cleaning house and he thought someone would like the items. 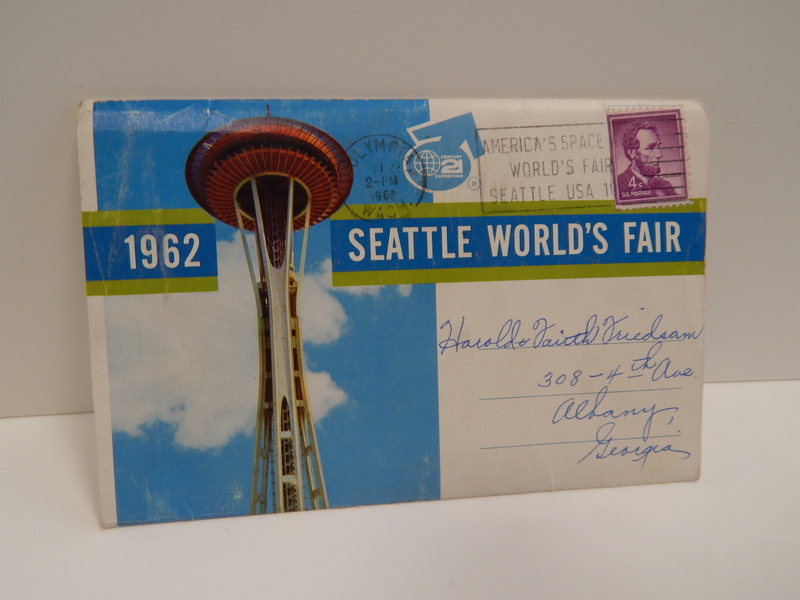 I fell for the Seattle Worlds Fair items he had. For 24 bucks I got this ashtray and charm bracelet. Check them out!! 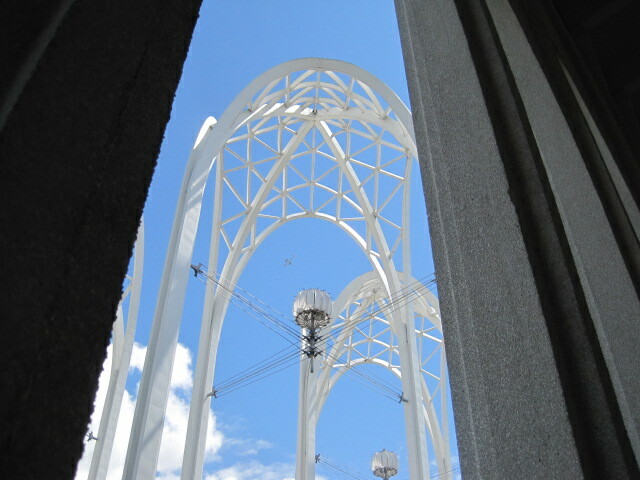 This ashtray is of the US Science Pavilion now called the Pacific Science Center. I have collected more items around this facility and will share them in the future. 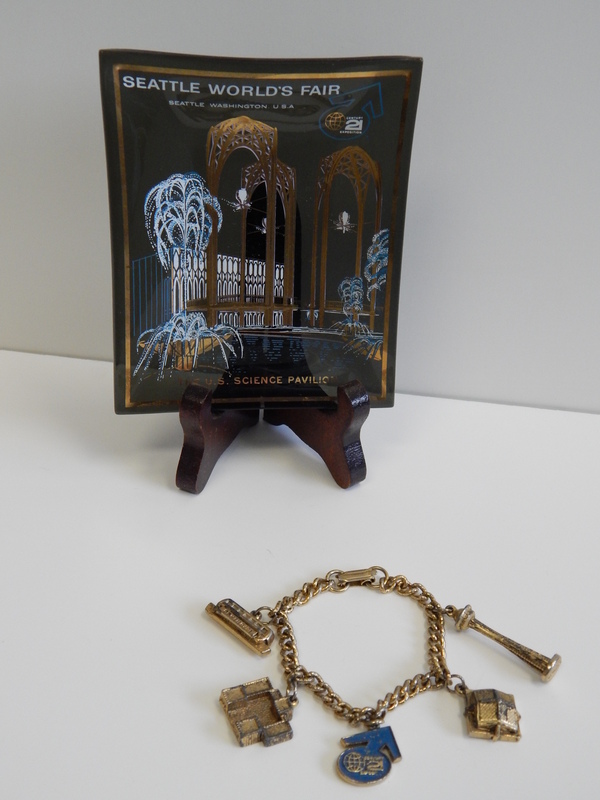 The bracelet has charms from left to right; the Monorail, the Science Pavilion, the Century 21 logo, the Washington State Pavilion (Coliseum/Key Arena), and the Space Needle. Next are a few close-ups so you can enjoy the finer details.